Our last day with Mademill / prototypeD was a blast! The youth had the opportunity to paint with Virtual Reality and water-based spray-paint. Thank you again to all the organizers at Mademill who made this 3 day workshop happen, to our educators, volunteers and staff. Photos by: Seyi Okuribido-Malcolm on behalf of DLG Media. A.R.T. In Action X AFO youth in Collab with MadeMill, PrototypeD from DLG (Dream Love Grow) Media on Vimeo. Please note this workshop is full. A.R.T. In Action is proud to partner with MadeMill and prototypeD to offer a specialized 3 day art workshop to youth with developmental disabilities. Youth will have the opportunity to learn about and use equipment for 3D printing, Motion Capture and Virtual Painting. This will be the launch of the second edition of Ottawa’s Colouring Book For Anyone! Featuring art by local artists and people who love to draw. A fundraising event to help raise money for A.R.T. 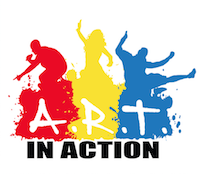 In Action’s free art workshops for youth facing multiple barriers in Ottawa and Nunavut. Last year funds helped to host a 10 day art workshop in Arviat, Nunavut. The art from the youth was displayed in the Toronto Transit and published on the front cover of First Air’s inflight magazine. Live art, art and goodies for sale, raffle prizes and colouring pages free for everyone! !